World Cup winner, Spain, won by a narrow margin against Haiti in Miami. Spain led in first-quarter play with two goals. Team members Cazorla and Fabregas scored one goal apiece, the first in eight minutes into the game, the second 11 minutes later, for an advantage of 2-0. Haitian Donald Guerrier completed an historic goal when Spain failed to connect during a trap play, for a 2-1 final score. He evaded goalkeeper Pepe Reina, who attempted a corner play which didn't succeed. Number one soccer team, Spain, narrowly defeated Haiti at a play game in Miami. Spain dominated the game with Cazorla making a first goal in eight minutes after game start. Spain scored again 11 minutes later with Fabregas's header to increase the advantage 2-0. 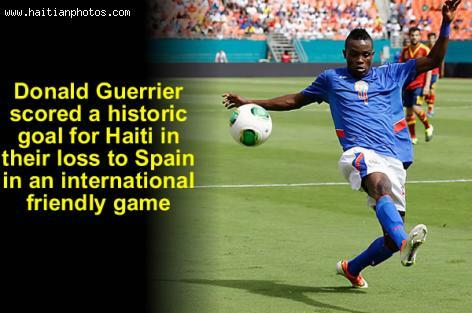 Haiti's Donald Guerrier made a historic goal for 2-1 after Spain didn't complete a trap play. He avoided goalkeeper Pepe Reina, who tried to wedge him in a corner play. Haiti ranks 59th in the world. Number-one ranked Spain narrowly beat Haiti in a 2-1 win at Sun Stadium. Spain made two goals during first-quarter plays for 2-0 edge. First goal occurred eight minutes into the game by Cazorla, and Fabregas scored the second 11 minutes later, giving Spain a 2-0 advantage. Les Grenadiers' Donald Guerrier scored an historic goal during an incomplete trap play by Spain. He rounded goalie Pepe Reina, who ran a corner play that didn't connect. Haiti ranks 59th in world standings. 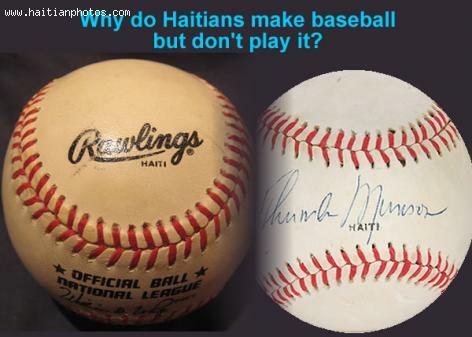 Why Do Haitians made baseball but never played it? Very interesting question. Back in the 1960′s or 1970′s most baseballs used in the American National league were made in Haiti. You would think that many Haitians would be baseball players, playing in Major League Baseball. That is not the case. In the meantime, on the other side of the island, the Dominican Republic, many are making a fortune playing the game. According to history, it has everything to do with the American occupation of 1915. Unlike American invasions in other countries that were relatively brief, the Haitian occupation lasted 19 years and was brutal. The Haitians were not interested in anything that was American at the time and instead played soccer. 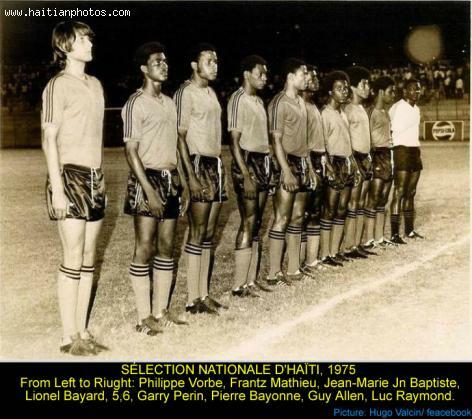 Here is a picture of Haiti National team in 1974. This is what many would call Haiti Dream Team, the 1974 World Cup team. 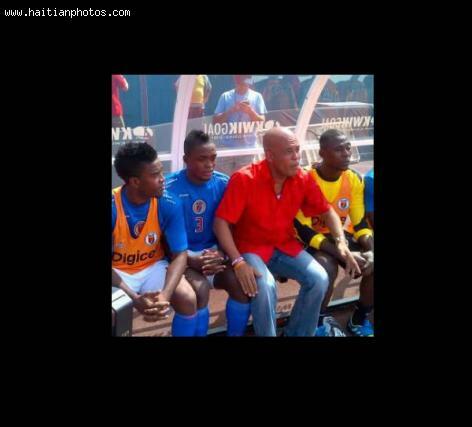 Haiti's coach was Antoine Tassy. He was also the team's trainer as well as being the country's Director of Sport. The main teams who made the National team were: Racing Club, Aigle Noir and Violette Athletic Club. 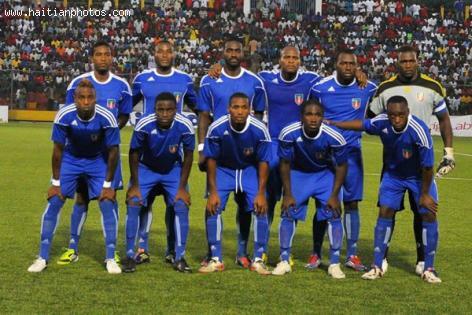 The goalkeeper, Henri Francillon, was the only player in Haiti team who came from Port-au-Prince's Victory club. 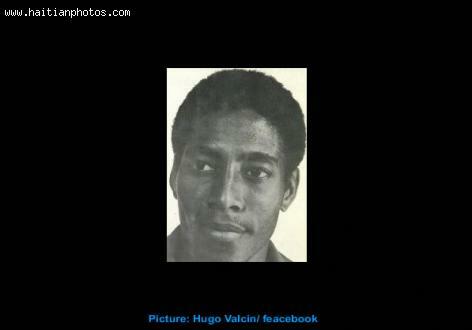 Here is a picture of Pierre Bayonne, Haitian Soccer Team World player at the Cup 1974 FIFA World Cup. 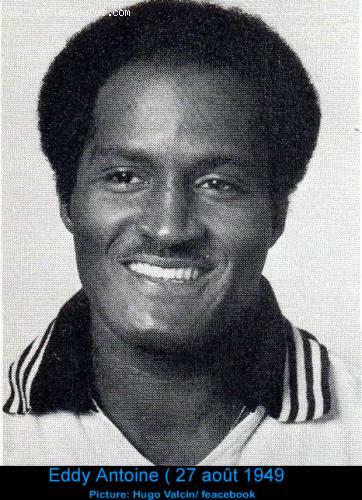 Pierre Bayonne was born on June 11, 1949 and played for the Violette Athlete Club in Port-au-Prince. Guy Saint-Vil was born October 21, 1942. 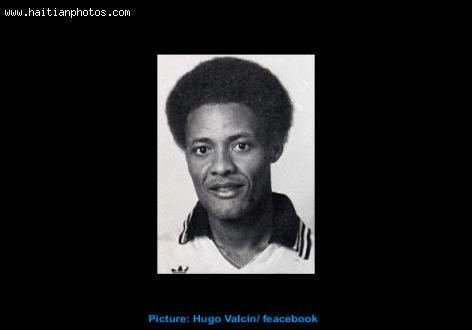 He was a Haitian football who played forward position. A Member of the Recine club Haitien. 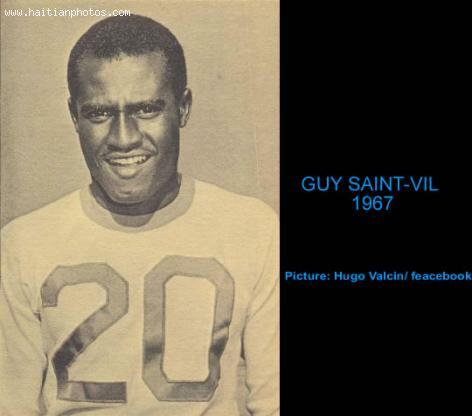 Guy Saint-Vil played for Haiti in the 1974 FIFA World Cup. The Haitian soccer team that represented Haiti at the World Cup was comprised of: Oriol, Serge Ducoste, Henri Françillon, Ernst Jn. Joseph, Arsène Auguste (Pelao), Philip Vorbes, Wilner Nazaire (Captain), Jn. Claude Désir (Tom Pouce), Emmanuel Sanon (Manno). Yacinthe, Claudel Legros, Guy St. Vil, Roger ST.Vil, Eddy Antoine, Fito Léandre, Claude Barthelmy, Guy François, Fito Plantin, René Vertus. Wilner Piquant, Bobby, Pierre Bayonne, Formose Giles, Mario Léandre, Masson. Here is a picture of Ernst Jean-Joseph who is also known as Ti Nes and Grimo. Ernst Jean-Joseph was born on June 11, 1948. His position in the Haitian football team was midfielder. 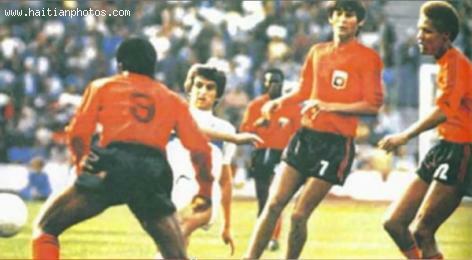 he was one of the players who represented Haiti at the 1974 FIFA World Cup in Germany.